This season, a true original comes to Broadway at Lincoln Center. 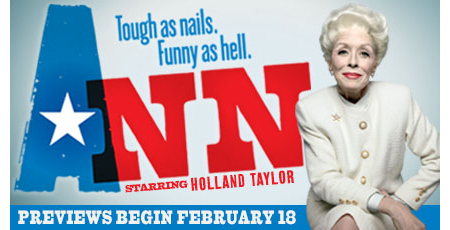 ANN is an intimate, no-holds-barred portrait of Ann Richards, the legendary governor of Texas. This inspiring and hilarious new play brings us face to face with a complex, colorful and captivating character bigger than the state from which she hailed. Written and performed by Emmy® Award winner Holland Taylor ("Two and a Half Men"), ANN takes a revealing look at the impassioned woman who enriched the lives of her followers, friends and family. Holland Taylor: During her outstanding career, Holland Taylor has been nominated for six Emmy Awards and won for her supporting role on "The Practice." For the past ten seasons, she has delighted audiences as Evelyn Harper on the hit comedy "Two and a Half Men." Her many film credits include Legally Blonde, Baby Mama and The Truman Show. Ms. Taylor was also named one of Newsweek's "150 Fearless Women"
*Offer valid for performances thru 4/14/13. Additional blackout dates may apply. Offer subject to availability and prior sale. All sales are final. No refunds or exchanges. Offer may be modified or revoked at any time without notice. All phone and Internet offers subject to normal service charges. Offer available for select seats and performances. Limit 6 tickets per order.